Esri founders Jack and Laura Dangermond started their company 50 years ago to help address some of the world’s most difficult challenges: land-use issues, resource management concerns, population shifts, changes in the environment, and much more. 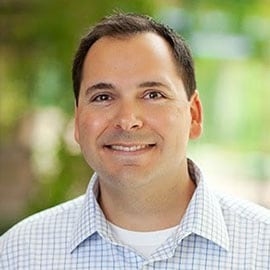 Since its founding, Esri has always stood shoulder to shoulder with its users. That’s no different when disaster strikes. 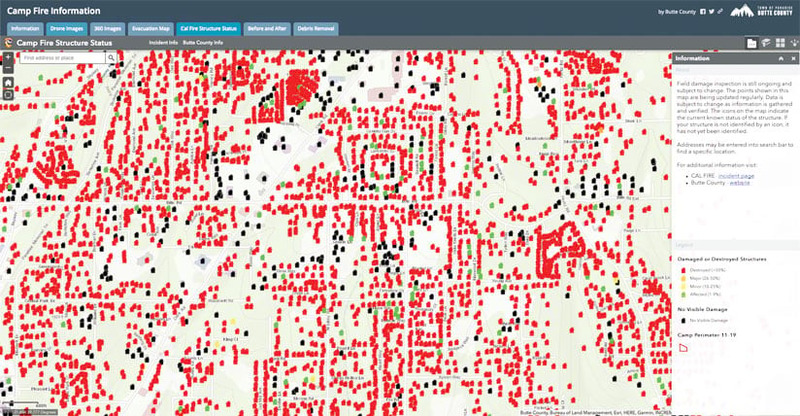 The Disaster Response Program (DRP) at Esri exists to help users respond to and enhance their GIS operations when hurricanes, fires, earthquakes, oil spills, and other crises overwhelm their organizations and demand escalated action. 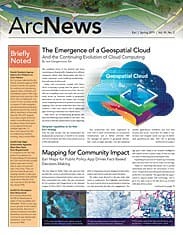 Assistance from the DRP comes in many forms and can involve getting users access to ArcGIS software and available data, assisting with workflows, and providing technical support. The first activation of the then-unofficial DRP was 25 years ago, when authorities dealing with the aftermath of the 6.7-magnitude Northridge Earthquake reached out to Esri for help. The destruction throughout Southern California was extensive: buildings cracked and crumpled, freeway overpasses collapsed, and at least 57 people died while an estimated 9,000 suffered injuries. According to its GIS manager, Butte County was actually prepared for a big wildfire, just not enough for the Camp Fire. It quickly turned from a wildland fire into an urban fire when it entered the town of Paradise. Another big activation for the DRP was in New York City after September 11, 2001. When the twin towers located at 1 and 2 World Trade Center collapsed, the city’s state-of-the-art emergency operations center (EOC), located at 7 World Trade Center, was damaged beyond repair. Within a few days, the city relocated the EOC to Pier 92, a large shipping terminal on the Hudson River, and Esri was there to help. For Hurricane Katrina in 2005, the DRP provided direct aid to several agencies. It helped put together a regional database, assisted with search-and-rescue operations, supported damage assessments, and did map production. When the BP oil spill happened in the Gulf of Mexico in 2010, Esri provided the GIS capabilities to get multiple organizations with wide-ranging needs to collaborate and gain a common situational awareness. “That was where we really saw how we could support not only traditional public safety agencies but also other types of organizations and needs all over the world,” said Lanclos. It was then that the DRP really began to formalize. Internally, Esri established how the DRP could best respond to and prepare for emergencies, as well as how to have users activate the program when they needed it. If organizations use [the emergency management operations solution] as a road map for getting started with preparedness efforts, they can be ready for the next incident. They should do this today, even without the DRP. The DRP has responded to countless hurricanes and wildfires, helped map disease outbreaks all over the world, and even provided assistance when multiple agencies from different countries needed to rapidly share geospatial data after Malaysia Airlines flight MH17 was downed in Ukraine in 2014. Two years ago, the DRP experienced its busiest year on record with three major hurricanes—Harvey, Irma, and Maria—striking the Caribbean and the southern United States within about a month of one another, plus multiple devastating fires and severe flooding elsewhere. Unsurprisingly, the work never stops. When Hurricane Michael struck the Florida panhandle in October 2018 as a category 4 storm, Bay County sustained extensive damage. The 10-foot storm surge cut the barrier island of Cape San Blas in two and devastated the small town of Mexico Beach. “We reached out to Bay County before the hurricane, but we didn’t hear anything until about 24 to 48 hours after landfall,” said Keith Cooke, an account executive for local government at Esri. This was a rare occasion when Esri opted to deploy people on-site, so with support from the DRP, both Cooke and Meyers went straight to Bay County to help out. They assisted with general mapping, established a Web GIS presence within the EOC, and helped develop a damage assessment workflow. The two also built dashboards that officials used in their morning and evening EOC briefings, including one that showed how badly the storm had affected local businesses. 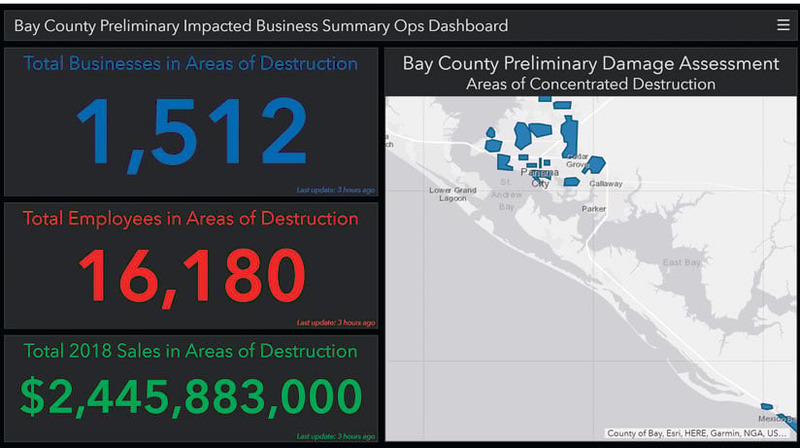 A dashboard showed Bay County officials how the storm had affected local businesses. Esri’s DRP jumped into action for the November 2018 Camp Fire, too, which burned more than 150,000 acres, destroyed almost 19,000 structures, caused 86 fatalities, and devastated the town of Paradise in Butte County, California. Esri DRP member Chris “Fern” Ferner jumped in to help Aranguren and Butte County manage their emergency needs. With Ferner engaged, the DRP opened up Butte County’s ArcGIS Online organizational account, assisted with the surge of staff by giving it additional named users, and helped fix an app it was having trouble with. Interestingly, Butte County was actually prepared for a big wildfire, as well as flooding, given where it’s located—in the foothills of the Sierra Nevada mountains, amid a lot of woodland. It just didn’t have enough resources to support the scale of this incident, which quickly turned from a wildland fire into an urban fire when it tore into the ridge town of Paradise. The DRP’s long history has led to a better understanding of how organizations can prepare for the next event. A new solution for emergency management operations provides an integrated set of tools that address common workflows related to disasters. It was developed based on the DRP’s real-world experiences. “People typically need to think about three main areas,” explained Lanclos. First, assess how to maintain situational awareness and how to use GIS to do it. Second, figure out how to get teams out in the field to collect data and then get it back to the EOC. Third, determine how to manage public information so citizens know which actions to take and when. Learn more about the DRP and get started with the emergency management operations solution.